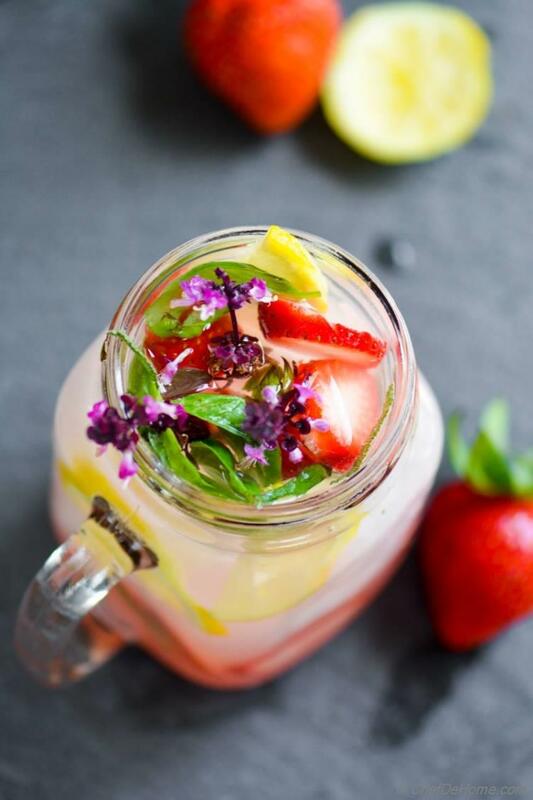 A refreshing, seasonal fresh strawberries, tropical lychee nuts and basil mojito for your next Outdoor BBQ Party. This is a drink, your guest will be asking 'recipe' for, I'm telling yaa! It is healthy and satisfying to use local ingredients and home grown herbs to mix up drinks for friends and family. Home grown or store bought, fruit based drinks are my favorite drinks to entertain for parties - one drink can be served to all age groups. Local and fresh ingredients really speak to you with their color, flavor and taste like these gorgeous strawberries and stunning purple basil flowers. Of-course there can be beer or wine for adults, but no one misses opportunity to taste fruity cocktails. This Mojito recipe is a slight shift from classic Mint Mojitos. My version of Mojito has some dazzling purple sweet basil flower from my herb garden (okay, herb pot to be precise, though calling it a garden has its own charm. smiles) I love, love purple basil for its color and aromatic flavor yet little less sharp taste. 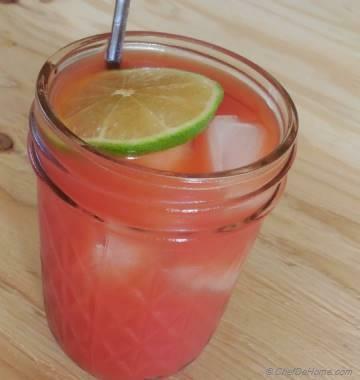 Another favorite ingredient in this drink is Litchi Juice, sweet and mild in taste, it blends perfectly with any drink. 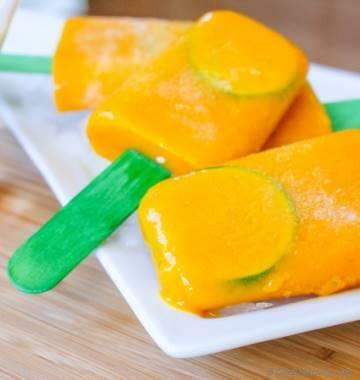 I often use litchi juice instead of sugar syrups in drinks, it's refreshing sweet and floral aroma pairs perfectly with sharp citrus or tart berry drinks. PS: This picture above is from Chef De Home old recipe files. When I made this Mojito again, recently, I clicked pictures again to add some 'life of New Colors' (courtesy my new DSLR Camera) to this refreshing drink! 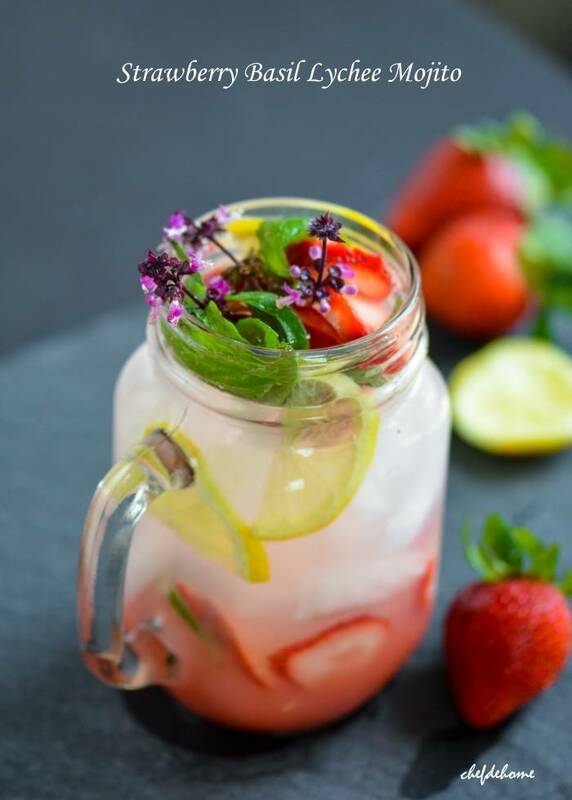 Strawberry Basil Mojito is best prepared just before serving. However, for parties, you can slice strawberries, juice limes (or lemons) and keep glasses ready. Mix drink 30 minutes before guest start arriving and pour over ice filled glasses just before serving. Smart Swap You can also use raspberries or both for this mojito! 1. Fill four 8-10 oz (1 & 1/2 cup) glasses with ice and keep aside. 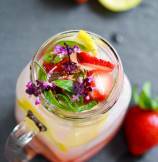 In a glass or drink muddling jar, add basil leaves, half cup sliced strawberries, pinch of salt and muddle to release flavor. For non-alcohol version, skip vodka while mixing ingredients and add it later only for elders. 2. Now add lime/lemon juice, vodka, lychee juice. Shake well. 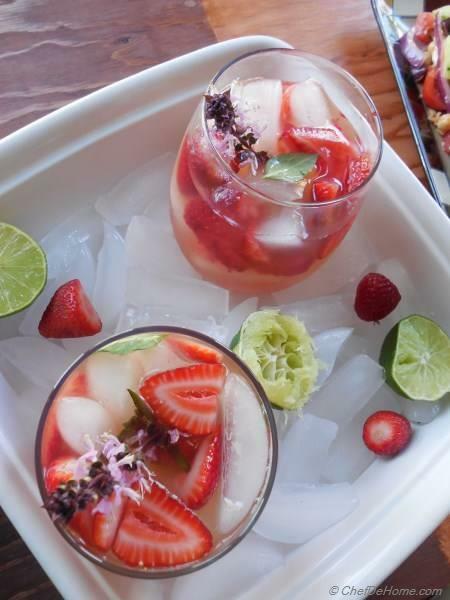 Divide equally among four ice filled glasses, fill rest of glass with sparkling water (per your liking), garnish with remaining 1/2 cup slices strawberries, basil flowers and serve immediately. This was my first cocktail and it turned out great! thank you for the detailed recipe. Cheers! Love that you enjoyed, Arpita! Cheers indeed! Love the clicks, presentation and the mojito!!! I would love it with a hint of alcohol though and love the purple basil on top, i dont think we find that commonly here! yeah, not so common in India! You can use mint instead, goes great in this drink! Reading your comment is sure a treat, Piyali! thanks for wonderful words! I appreciate that! Never tried purple basil flowers. Sounds super good!! Thanks Savita will try it without alcohol. Exceptional pictures too !! Anu, purple basil or thai basil has very uniquie basil taste (little different from Holly Basil) I love using it in stir-fries or drinks.